From invading the attic and setting up their nests there, or damaging lawns and trees, squirrels have done all this and a lot more on certain properties. So if you’re up against a similar situation, you would also need to learn how to get rid of them! Denying squirrels every source of food is probably the only solution that would discourage squirrels from encroaching upon your property. However, this is easier said than done. Squirrels find food even in the barks of trees, let alone the bird feeder, your pets’ food, and anything you may have left behind after a lunch outdoors. So keeping a check on their food source is indeed a tough challenge, but a necessary one. 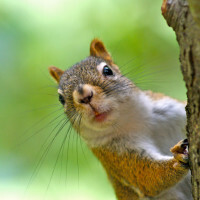 If municipal regulations allow it in your area, trapping squirrels and then relocating them to a safe distance from your area is a good choice too. However, squirrels are sometimes too smart for traps! There are also scare tactics like leaving a radio on in the attic, or using flashing lights that manage to scare squirrels away. However, if the squirrel invasion you’re up against is a serious one, do not try and handle the situation by yourself. You could probably end up making matters worse. When the situation is a serious one, calling in a professional squirrel removal team is the best choice. These teams have sufficient experience in handling similar problems and are therefore quite reliable. Moreover, even on the cost front, it is always a good idea to invest in one surefire solution, rather than investing in loads of DIY techniques that may or may not work.